We don’t really discuss credit cards on Shopper Points and leave this to our sister travel loyalty site Head for Points. However every now and then there is an offer on loyalty credit cards with generous sign up bonuses of Clubcard or Nectar points and we like to take a look. 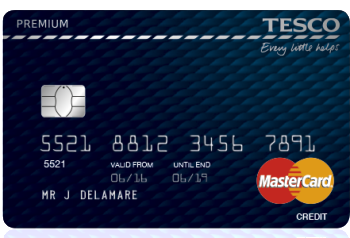 Back in June 2016 Tesco launched their Tesco Premium Credit Card. The representative APR is 56.5% variable, including the fee, assuming a £1200 credit limit. As you were looking at a £150 annual fee for a list of benefits which was not overwhelming, we were not very excited by it. Until now. Currently Tesco Bank is currently offering its biggest ever sign-up bonus – 5,000 Clubcard points! The offer is available until 11th July. There is NO spending target to hit to receive the bonus. All you need to do is use the card to make one purchase at Tesco, either in-store or online, within two months of receiving it. As the annual fee is £150, you are paying £150 to receive 5,000 Clubcard points. Exchanged at 3 x face value for one of the better Clubcard Boost deals, the points are worth £150. You’d get £150 of Uber or hotels.com credit for example. On this basis, your costs are covered for the first year and you would still get the benefits of the card. This is in addition to your regular Clubcard points. In comparison the free Tesco Clubcard credit card gives you only 1 point for every £4 you spend in Tesco. If you spent a lot of money in Tesco, the value of these extra points would add up. Remember, though, that the free Tesco Bank debit card gives the same 1 point per £1 spent in Tesco. You can get this benefit without spending £150 on a credit card. This sounds like a lot of money to spend in a supermarket. However if you’ve got a large family and/or are a driver and buy your fuel at Tesco petrol stations, you can hit the target. Adding in the base earning rate of 1 point per £1 spent in Tesco, you would earn 8,750 more Clubcard points per year using the Premium credit card instead of the free Tesco credit card if you spent £5,000 in Tesco. That is made up of the 5,000 bonus Clubcard points and the extra 3,750 points earned for spending £5,000 in-store. The premium credit card comes with a travel insurance covering your immediate family. If you are currently paying for travel insurance then this would have some value, although you should check the small print carefully regarding things like winter sports, maximum length of trip and pre-existing conditions. There are better credit cards out there with 0% foreign exchange fees when spending abroad. I’m not sure you need to travel with a huge amount of foreign currency in your suitcase these days. This is good but remember that Tesco rounds down every transaction to the nearest £4. A £7.99 transaction only earns 1 point and a £3.99 transaction earns nothing. However, a lot of other rewards cards have cut their rates recently – the ASDA Money credit card recently dropped to 0.2% today from its previous 0.5% – which makes the Tesco Premium rate better by comparison. Receiving 5,000 Clubcard points definitely makes this offer more attractive. However, not everyone will get the most out of this offer. If you spend money on Uber and would definitely get £150 of value from the sign-up bonus, you might as well apply. The card is basically free to you and you are getting free travel insurance and a decent earning rate on your spending. Even then, I’m not sure if the card is worth keeping for more than a year. From the second year, you will still be paying the £150 annual fee but you won’t be getting another 5,000 Clubcard points as a sign-up bonus. You’d need to be spending over £5,000 per year in Tesco and using the travel insurance to get value after Year 1. The application page for the Tesco Premium Credit Card is here. You will receive 5,000 bonus Clubcard points if you apply before 11th July. Disclaimer: Head for Points and Shopper Points are journalistic websites. Nothing here should be construed as financial advice, and it is your own responsibility to ensure that any product is right for your circumstances. Recommendations are based primarily on the ability to earn miles and points and do not consider interest rates, service levels or any impact on your credit history. By recommending credit cards on this site, I am – technically – acting as a credit broker. Robert Burgess, trading as Head for Points, is regulated and authorised by the Financial Conduct Authority. Why only £3750 for a £5000 spend – at 1pt per £ shouldn’t that be 5k points? Because if you used the free Tesco credit card you would get 1250 Clubcard points for £5k Tesco spend. Ah, ok. Still, 5k sign up bonus, 5k for a £5k spend, plus 3.75k points for the spend itself = 13.75k points in year one – which would be £412 (at 3x face value), or 33,000 avios wouldn’t it? Minus the £150 fee = £262. If you can spend 5k in Tesco (noting impending closure of Tesco direct) and value the other benefits it’s an ok deal for a non-Amex. For me the IHG Premium is the best non-Amex, especially in year 1. Me and Mrs W have kept 2 going for multiple years.